Monday to Friday: 6a.m. to 3p.m. 77-79 Bassett Street, Mona Vale. 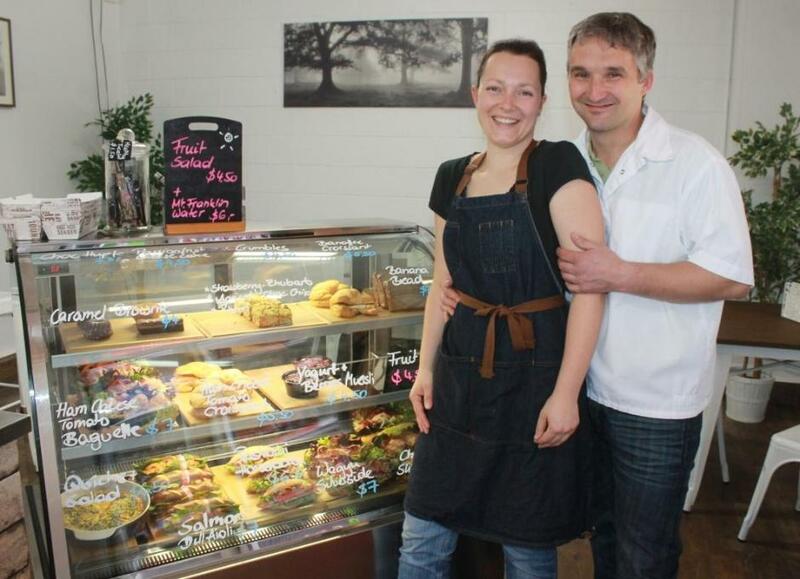 A few weeks ago we visited Tino and Kati Dees at their Café Edelweiss and were fortunate to be shown the German Butchery works by Mr. Dees, a Master Butcher who learned his skills in Germany prior to bringing them here. Mr. Dees and his team are the experts in German & Continental smallgoods and meat products made the traditional way, the way it should be! Passionate about producing to the highest quality standard, they bring the authentic taste of Germany and Europe straight to your home. At Café Edelweiss, run by Kati Dees, you can taste some of these products. or a Cheese and ham/salami baguette. You can also show your student ID to get 25% off any other item on the menu. After we had a very good coffee Tino had us don hairnets and butchers whites to show us where the magic happens. The German Butcher’s factory is designed and fitted to the highest food safety and workplace standards. They produce five days a week and supply clients in hospitality and food wholesale. You can buy some of their products at Simply Irresistible German Small Goods at Shp8/ 1442 Pittwater Rd, North Narrabeen, or if you have a large order, and want half a ton of real German Potato Salad to go with it, contact them to discuss your needs. Similarly, if heading out on the water, or into the National Park via Church Point, stop in and grab the best stuff for the best picnic. Tino insisted on loading us up real Bratwurst, frankfurters and what must become a market leader in bacon in this state, and perhaps Australia. Much of the bacon you buy is already cooked. It’s loaded with preservatives and has been oversalted in many cases. This is where the difference between a Butcher and a Master Butcher shows. Tino’s Canadian Style Maple Bacon (Short Cut) is a traditional raw Speck and it is divine, easily the best, bar none, we have ever ever had. This Bacon won a Gold medal at this year’s Sydney Royal Spring Fine Food Show – Deli Meat Competition which follows on from wins in 2013 and 2014. German Butchery in only their second year of exhibiting followed up two championship wins in 2013 with another two in 2014, winning a Champion Poultry Product for their Chicken Frankfurter and Champion Gourmet Product for their Gypsy Neck. So too with the wonderful assortment of real, that’s REAL, German sausages. If you have ever been to Germany and tasted traditional street food, and now miss Kranskys to the point of thinking of catching a plane back to taste them again, spend the money instead on a visit to Mona Vale and get some of Tino’s Chilli Cheese Kransky instead - an absolute standout that is becoming legendary along Bassett street. Although Tino shrugs off the accolades which have instantly marked his products as being of the highest prize winning standard, there is clearly a lot of passion and dedication to producing something authentic and of the best possible quality. We suggest you try some as soon as you can, it’s the real deal. You can find out more about all the wonderful products available at Narrabeen and at Bexley on the German Butchery website – Summer is coming, spoil yourself and have some real prize winning sausages and smallgoods to lift your next party platters to ‘best ever’. 3a/77-79 Bassett Street, Mona Vale, NSW.